The cool thing about homesteading (to me anyway) is that there are so many ways to approach a project. 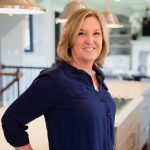 From the homes we choose to the way we cook our food, all of us here on the farm have visions of how we want to approach certain things and we are fortunate enough to have the freedom to pursue our imaginations. Guess homesteading imagination runs in the family. My cousin and his lovely wife live on acreage and board horses. Recently, my cousin (I’ll call him Vic. 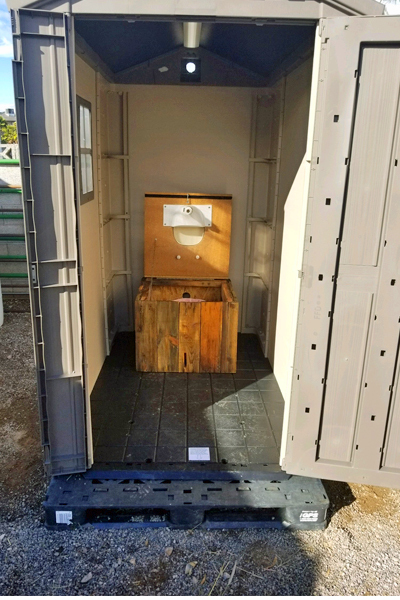 Since that’s his name and all) decided to build a backyard compost toilet to accommodate the customers that board their horses at their facility. So why did I mention “different ways to approach a project”? 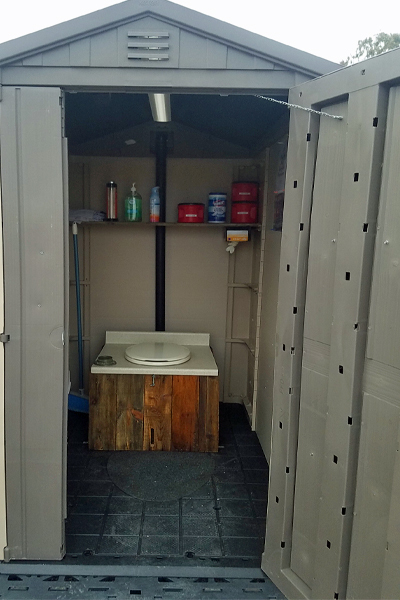 Well, if you remember our gypsy camp compost toilet set up (and yes, we are still using it when we are in that area of the farm) it’s nothing like the deluxe version Vic built! 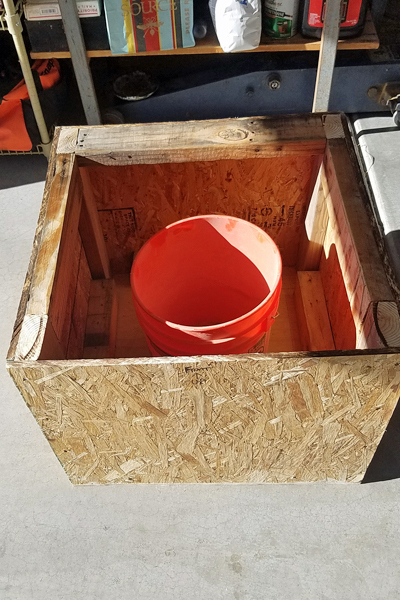 “The first thing we did was build a 24″ x 24” box to hold the bucket and bottle. It’s a common 5 gallon bucket from a local big box hardware store or whatever bucket you may have laying around. The bottle is a large Tropicana Lemonade bottle. You’ll see how the bottle comes into play later in the build. 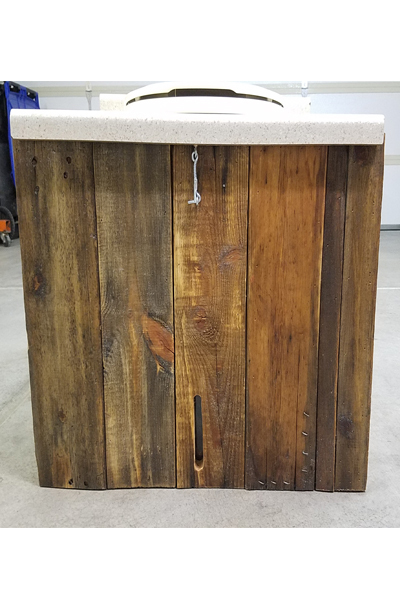 Then I added pallet wood to the outside of the box to look rustic. Everything is screwed together with rust proof screws, I had all the wood laying around from previous projects. For the top we used some kitchen counter material. It seemed easy to clean if anything was spilled on it and simple to work with. We finished the pallet exterior with THOMPSON Water Sealer on ALL the wood. Top/bottom/sides/upper/lower/inner and outer. 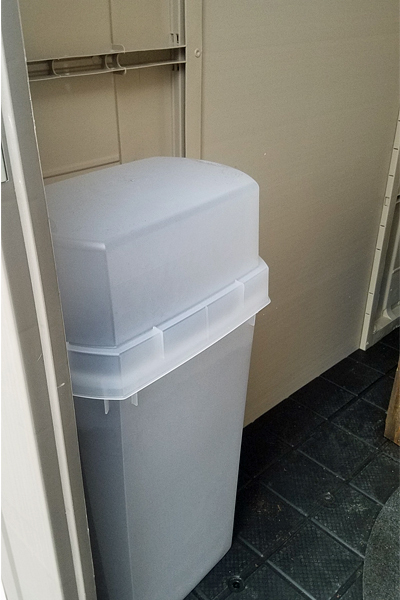 I used a stainless steel hinge to mount the counter top for easy opening and access to the waste. 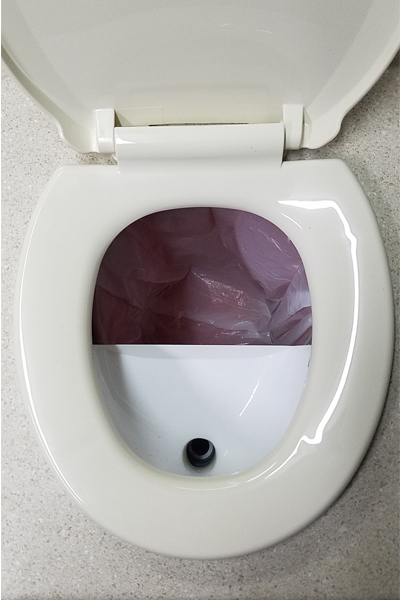 Next I figured out where the toilet seat needed to go and cut the hole in the counter top and attached the seat ( I had a spare one). Then I attached the urine separator. 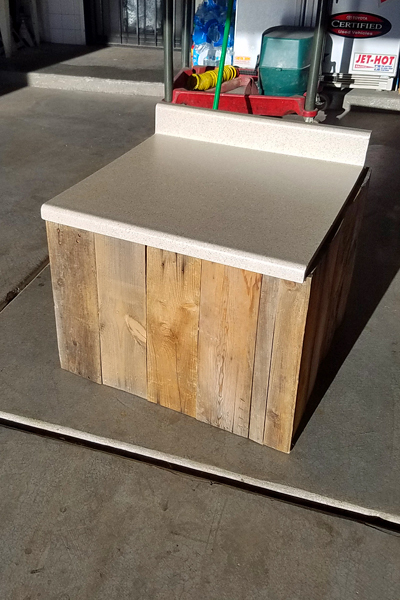 Silicon sealer was used to seal it to the lid where it attached to help any liquids go where they are supposed to go and not soak into the wood. Now it was time to create the shed. 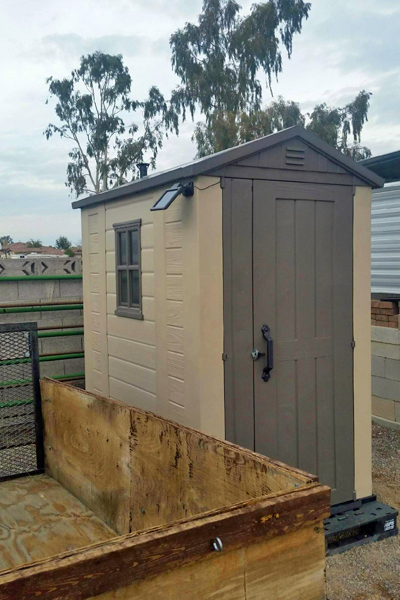 The shed is from Bed Bath and Beyond, it is 4′ x 6′. I placed the shed in the backyard on a level spot on pallets. 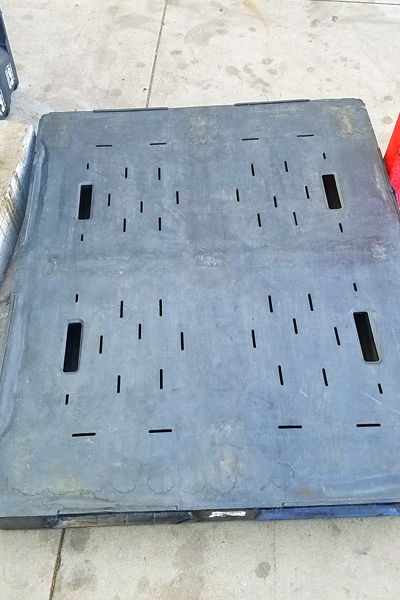 I was able to get plastic pallets. I’m sure wood ones would work just fine. I used 2 and the shed fit perfectly. I screwed the shed to the pallets to help keep the wind from knocking it over. 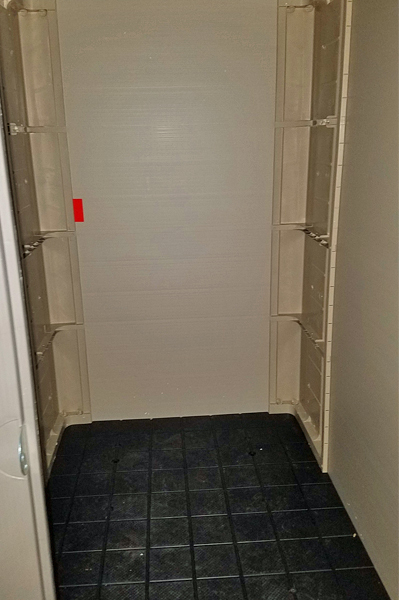 I placed the toilet in the shed far enough back to give lots of room in front of it so our customers can remove jackets or whatever, and far enough from the back wall to allow the lid to open and vent pipe to clear. You can see the urine diverter best in this pic. The diverter comes with instructions on what size hose to use to drain into the bottle. (I used stuff for the pool I had laying around). Here’s the shed mounted and in place. You can see the vent pipe come out the back at the top of the shed. I used a venturi top that is for motor-homes. No electricity or moving parts. It works with a breeze and creates a low pressure area, which evacuates any smell. I used black 2′ pipe and cut a 2′ hole in the back of the toilet box for the pipe to fit. A solar light with motion sensor was added and when you enter at night the light comes on. I added a shelf inside for toilet paper storage. We used coffee cans (Folgers) with lids to store the toilet paper and keep critters out. We added some hand sanitizer, towels, gloves and wet wipes on the shelf as well. 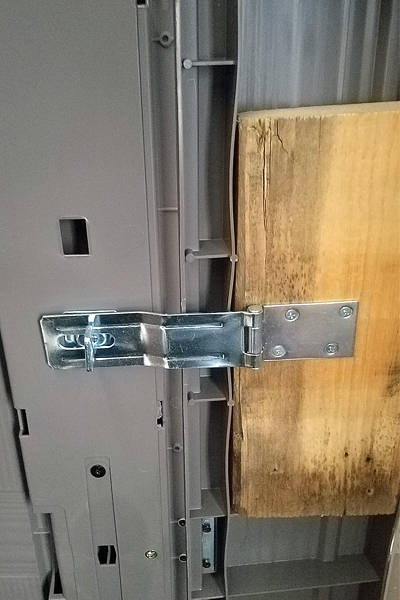 Since this is a shed, I had to put a way to lock the door from the inside. 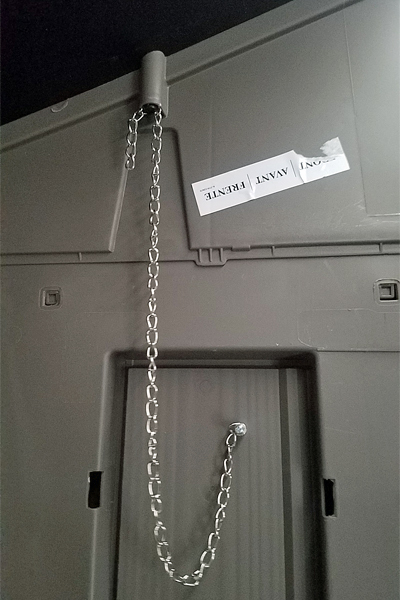 I also added a chain to the door so the wind won’t blow it open and break it. 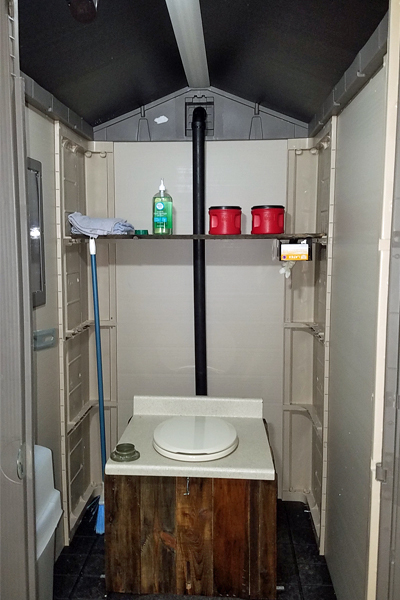 There is a bin located inside the outhouse that has peat moss and cedar mix with a scoop to cover things when done. 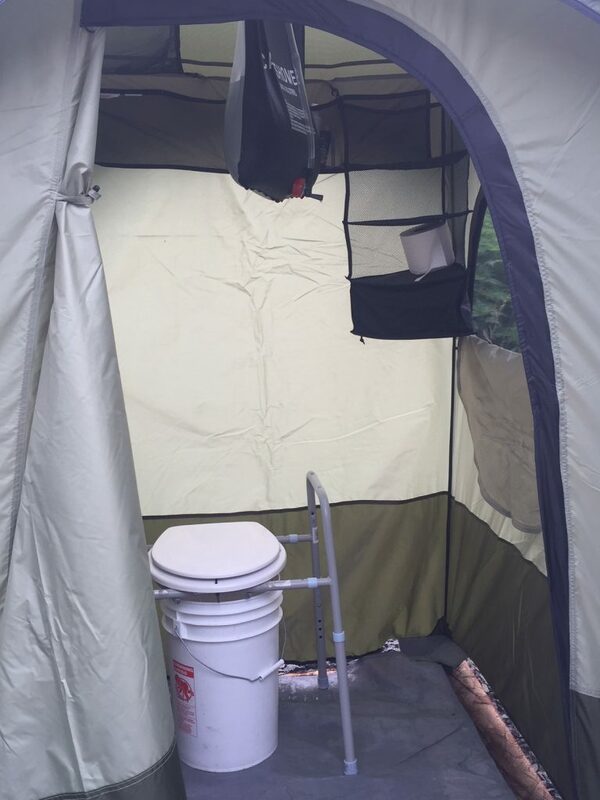 We added signs inside to help people who haven’t used an outhouse, use the outhouse properly. 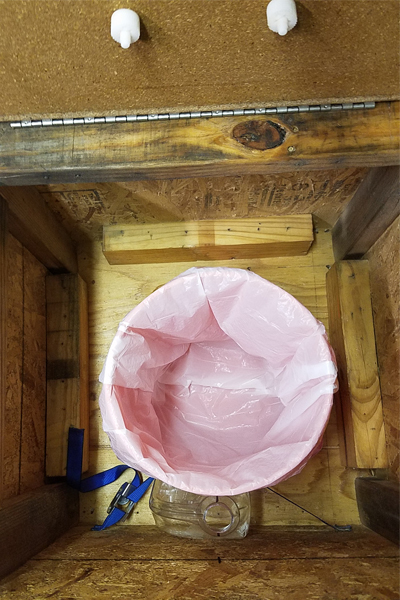 This outhouse has been used and there are deposits in both bucket and bottle…THERE’S ZERO SMELL except for peat moss/cedar mix. Actually smells like the outdoors! Very do-able. We added a few extras such as: A magazine holder for your favorite reading material. 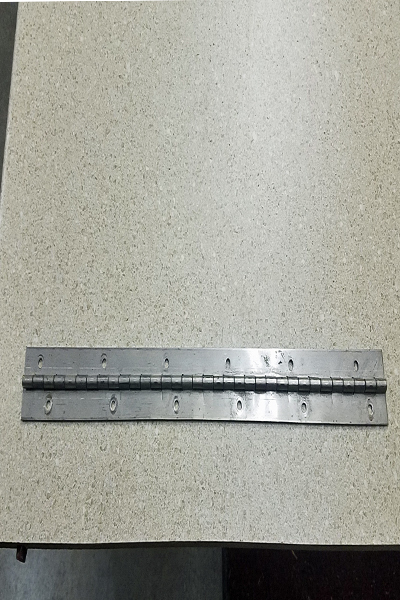 A toilet paper holder made by one of the people who keep their horse here. It’s made from old horse shoes”. 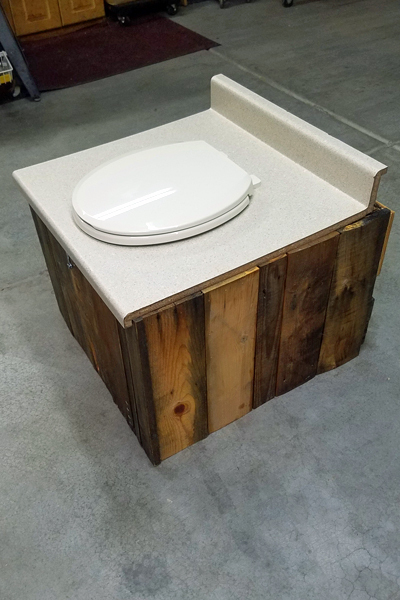 A BIG thank you to Vic and Kristi for sharing, in detail, how they built this fantastic compost toilet! Just goes to show that homesteading skills can be applied anywhere. Have you ever used a compost toilet? Man Vic! 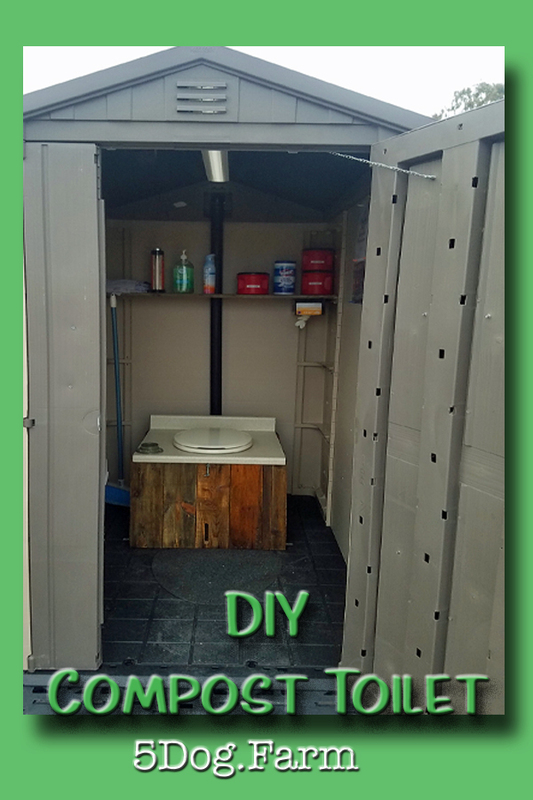 This is the nicest outhouse I’ve seen 😍 Your detailed instructions makes it so easy for anyone to achieve this task. I would like to put one out on my property so that I wouldn’t have to go in the house each time. Thank you and I can’t wait to see what else you will be contributing! Thank you for your kind words 😁👍❤️ We had fun building “The Park” and love the fact everyone can use it.